Sandi has operated as a sole practitioner in Ponsonby since early 1984 when she established her first practice. 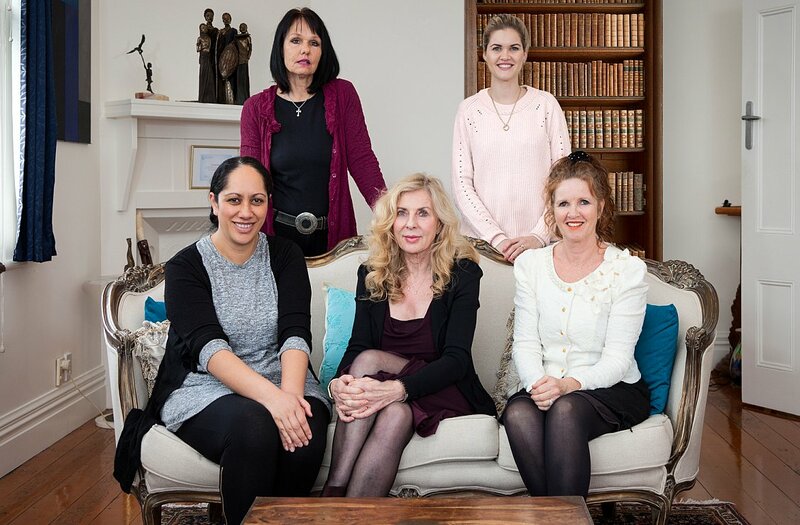 Her practice is herself and her support team; Lucy (sitting left), Annette (sitting right), Chelsea (standing right) and Fiona (standing left). 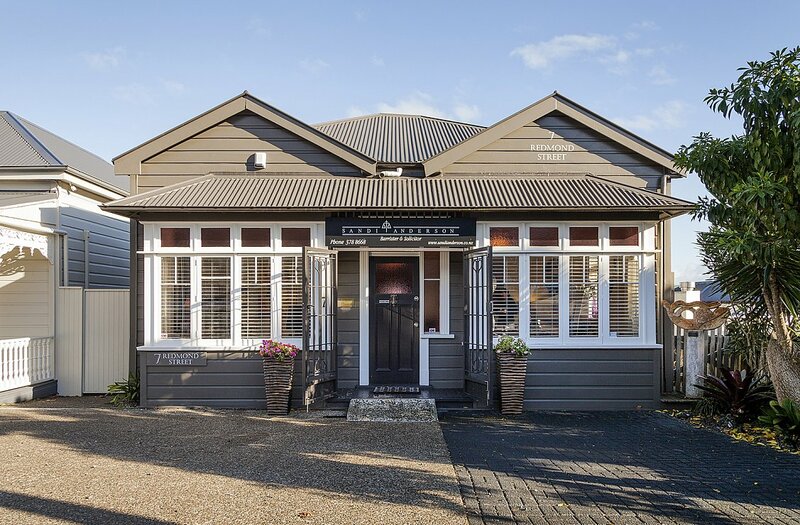 Sandi has been a sole practitioner in Ponsonby since establishing her first practice in 1984, which operated until 1989. After five years away in Europe working in an unrelated business, the return to New Zealand saw the establishment of the current practice at the beginning of 1994. This law practice has a support team of four staff and whilst it is a general practice, the emphasis is on residential and commercial conveyancing, trusts, estates and small business. Necessarily as a general practitioner, Sandi has developed a network of experts in all areas of law and commerce who are able to independently offer their services to ensure the most beneficial outcome wherever possible. 1.1 Thank you for instructing the writer and her firm, Sandi Anderson, Barrister & Solicitor to assist you in legal matters. 1.2 This document is an attempt to set out the basis on which I will meet your legal needs but of course I’m very happy always to discuss the specific requirements that you have from time to time. › Legal Executive/Legal Assistant’s time is charged at $200.00 per hour plus GST, but there are no additional charges for secretarial, word processing and similar services. › There are additional charges for disbursements and office expenses which include photocopying, postage and printing also land transfer registration and consultancy fees. These are itemised separately. › The cost for retrieving an old file from our secure off-site storage is $50.00 plus GST. • The skill, specialised knowledge and responsibility required to perform the services properly. • The importance of the matter to you and the results achieved. • The urgency and circumstances in which the matter is undertaken and any time limitations imposed, including those imposed by you. • The degree of risk assumed by me in undertaking the services including the amount or value of the property involved. • The complexity of the matter and the difficulty or novelty of the questions involved. • The experience, reputation and ability of the members of my firm working on your matter. • The possibility that the acceptance of the particular instructions will preclude employment of me by other clients. • Whether the fee is fixed or conditional. • Any quote or estimate of fees given by me. • Any fee agreement entered into between you and me. • The reasonable costs of running my firm. • The fee customarily charged in the market and locality for work similar to yours. 2.2 Unless otherwise stated all fees are plus GST. The GST will be charged at the rate required by the law unless you are zero rated or exempt. 2.3 Out of pocket expenses such as search and registration fees, valuation fees, tolls, mobile calls, faxes and photocopying will be charged extra. 2.4 I will provide for you an estimate upon request. If that estimate is likely to be exceeded I shall let you know. 2.5 There are other methods of charging which suit certain types of work and I shall discuss those with you where they are appropriate. 2.6 All work done by me is charged on a fees basis apart from a commission of 5% which is taken on all gross interest accruing on funds deposited with my bank through my bulk deposit scheme. 3.1 My fees are to be paid within 14 days of my account being sent except on conveyancing matters where fees are payable immediately prior to or on settlement. 3.2 You authorise me to deduct my fees and expenses from funds held in my trust account on your behalf upon my issuing an invoice. My final account will be sent to you shortly after I have completed your work. 3.3 I do, however, issue interim accounts where that is appropriate. 3.4 My fees may be deducted from funds held in my trust account on your behalf. 3.5 I may ask you to pay fees in advance, but in those instances your payment will be held in my trust account and only paid to me by deduction when an account has been forwarded to you. 3.6 Out of pocket expenses are to be paid by you immediately upon request but substantial out of pocket expenses will be asked for in advance. 3.7 Interest may accrue on unpaid accounts at the rate of 12% per annum as from the due date until payment. Other action to recover unpaid fees may also be taken and the cost of such recovery may be added to the account due by you. 4.1 When your instructions have been completed I shall keep your file for a period of 7 years from completion and then destroy it. You are welcome to uplift your file provided that all fees and expenses have been paid. Please give me reasonable notice before collection your file should you wish to do so. By instructing me to act as your lawyer, you authorise me to destroy those papers or files seven years after the date of my final bill. This does not include any documents that you have given me for safekeeping: I will hold those documents until you tell me otherwise. 5.1 This Fund exists to provide compensation of up to $100,000.00 per claim for clients who suffer a pecuniary loss in certain circumstances. These circumstances are the theft by a lawyer of money or other valuable property entrusted to that lawyer while they are providing legal services to the public or while they are acting as a solicitor-trustee. Except in certain circumstances specified in the Lawyers and Conveyancers Act 2006, the Fidelity Fund does not cover a client for any loss relating to money that a lawyer is instructed to invest on behalf of the client. 6.1 I hold current Professional Indemnity Insurance which meets or exceeds the minimum standards from time to time specified by the New Zealand Law Society. I will provide you with particulars of the minimum standards upon request. 7.1 I do not accept liability for any loss arising from non receipt of any communication including email communications. 8.1 You are entitled to terminate your instructions to me upon giving me reasonable notice. I may terminate the retainer if there is good cause, such as you not providing me with instructions in a sufficiently timely way or in your unwillingness, ability or failure to pay my fee on an agreed basis, or, except in litigation matters, your adopting against my advice a course of action which I believe is highly imprudent, and may be inconsistent with my fundamental obligations as lawyers. 8.2 If I terminate this retainer I will give you reasonable notice so that you can arrange alternative representation and I shall give you reasonable assistance to find another lawyer. 8.3 My fees for services reasonably and properly provided to you prior to the termination of retainer shall be paid by you to uplifting your records and I may retain copies of your documents and records. 9.1 I reserve the right to stop work on your retainer if interim accounts are not paid on time or a request for information or action remains unsatisfied. 10.1 I maintain a procedure for handling any complaints by clients, designed to ensure that a complaint is dealt with promptly and fairly. 10.2 If you have a complaint about my services or charges, you may refer your complaint to the person in my firm who has overall responsibility for your work. 10.4 The Law Society operates the Lawyers Complaints Service and you are able to make a complaint to that service. To do so, phone 0800 261 801 and you will be connected to the nearest Complaints Service Office, which can provide information and advice about making a complaint. 11.1 As emails are not always secure, or may have defects (such as viruses), I do not accept responsibility and will not be liable for any damage or loss caused by an email that is intercepted, or has a virus of other defect. 12.1 I will treat all information I hold about you as private and confidential and will not disclose any information I hold on your behalf or about you unless I am required to do so by law or where it is necessary to do so to provide my services to you or when requested by you or with your consent. 13.1 I have procedures in place to identify and respond to conflicts of interest. If a conflict of interest arises I will advise you of this and follow the requirements and procedures set out in the Law Society’s Rules of Conduct and Client Care for Lawyers. 14.1 My duty of care is to you and not to any other person. Before any other person may rely on my advice, I must expressly agree to this. 15.1 I maintain a trust account for all funds which I receive from clients (except monies received for payment of my invoices). If I am holding significant funds on your behalf I will normally lodge those funds on interest bearing deposit with a bank. In that case I will charge an administration fee of 5% of the gross interest derived. (a) Any money that you pay to me for settlement or other purposes should be in cleared funds, and paid either by bank cheque of direct credit, made payable to “Sandi Anderson Trust Account”. Any certificates that you provide to me should be delivered to Sandi Anderson’s office and I will give you a receipt. (b) If I receive money or property from other people on your behalf, I will hold it in trust for you unless you instruct me otherwise. I will follow your instructions as to how money or property that I hold on your behalf is to be applied or distributed. If money has not been provided to me as cleared funds I may delay distributing it until I have received confirmation that the funds have been cleared. (c) The firm will keep records of all moneys and investment property that I hold on your behalf for at least the period that is legally required. During my normal office hours I can provide you with details of any financial transactions that relate to you. I will not provide you with receipts unless you specifically ask for them. (d) Money that I hold in my trust account on your behalf will not be audited. Similarly, property that I hold on your behalf and distribute will not be audited. 16.2 I cannot withhold from you, nor use for my own benefit, any money or property that I hold in trust on your behalf, except for money that I use to pay fees and expenses that I incur through acting as your lawyer, or for money that I deduct as my commission form the interest received on money that I hold on your behalf, or when I am legally required to withhold the money from you. 17.2 The obligations lawyers owe to clients are described in the Rules of conduct and client care for lawyers (the rules). Those obligations are subject to other overriding duties, including duties to the courts and to the justice system.17.3 If you have any questions, please visit www.lawsociety.org.nz or call 0800 261 801. 18.1 Any limitations on the extent of our obligations to you or any limitation or exclusion of liability is set out in my letter of engagement and these terms. 19.1 These Terms apply to any current engagement and also to any future engagement, whether or not I send you another copy of them. 19.2 I am entitled to change these Terms from time to time, in which case I will send you amended Terms. 19.3 My relationship with you is governed by New Zealand law and New Zealand courts have non-exclusive jurisdiction. 19.4 Where a client is a company, the person signing these terms of service personally guarantees payment by the company to me. 19.5 Where the name of a guarantor is completed on the front page of the letter of engagement that guarantor could be called upon to meet the obligation for fees if appropriate. 20.1 By instructing me to provide you with legal services you are deemed to have accepted these terms of engagement and I look forward to working with you. 20.2 These terms will apply to our relationship with you. 20.3 You do not need to sign these terms of engagement in order to accept them. 20.4 We will take your instructions to carry out work for you as acceptance of these terms and any changes to the terms which are either emailed to you or posted on our website, www.sandianderson.co.nz .